The magnificence of Central Australia has inspired a Territory health worker to create an award-winning beanie. 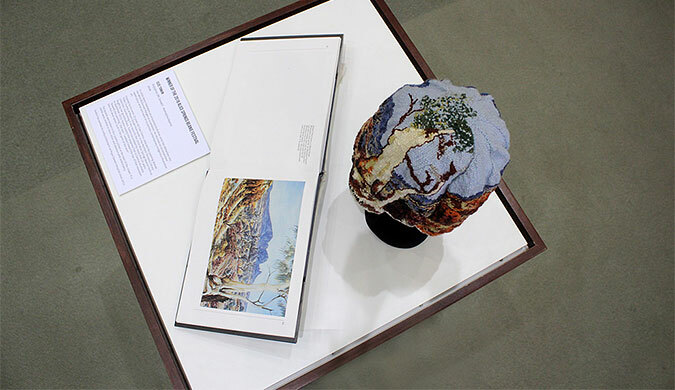 Clee Tonkin knitted the beanie, titled Rutjubma, earlier this year before entering it in the 2016 Alice Springs Beanie Festival. The beanie is 100 per cent pure Australian wool, knitted in linen stitch on 2.25mm needles, and finished with some embroidery. The theme for this year’s Beanie Festival was ‘Spirit of the Land’. The idea to replicate an Albert Namatjira watercolour was taken from a book of his works found at the Northern Territory Library in Darwin, titled The Life and Work of an Australian Painter, that inspired ‘Rutjubma’ which is the Western Arrernte name for Mount Sonder. “Rutjubma is based on one painting, an uncomplicated sky/horizon with a good balance of distinctly different colours as the range of colours available in yarn is somewhat limited compared to watercolours,” Ms Tonkin said. Rutjubma will be on display at the Northern Territory Library until 30 October 2016.